Considered by many scholars to be the world’s oldest and most sophisticated mind-body healing science, Ayurvedic medicine originated in India thousands of years ago. It continues to be one of India’s highly respected traditional health care systems. As a widely accepted and renowned medical approach that has survived and flourished for centuries, Ayurveda encompasses an enormous knowledge of nature-based medicine. Based on the relationship of the constitution and function of the human body to nature and the elements of the universe, this wellness approach is expected to continue to grow and increase in popularity as it gains awareness and acceptance in western cultures. Ayurveda’s complex approach to treatment is based on each individual’s distinct pattern of energy, as well as their specific combination of physical, mental and emotional characteristics. However, the basic principles of Ayurveda are simply to prevent and reduce the risk of illness by restoring and maintaining balance in the body, mind, and consciousness though proper diet, lifestyle, and the use of herbal remedies. 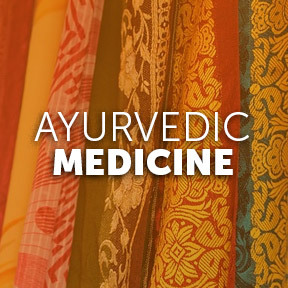 More than a system of treating illness, Ayurveda is guided by the belief that the mind and body are inextricably connected, and that the mind has the power to heal the body through awareness and restoration of mind-body balance. Meditation is one of the powerful tools prescribed for expanding self-awareness and inner calm in order to cultivate an innate state of balance to allow one to thrive and enhance wellbeing. Those familiar with Ayurvedic medicine may be aware of the extraordinary benefits of adaptogenic herbs. These healing plants help to balance, restore and protect the body, and have the unique ability to adapt their functions in accordance with an individual’s specific needs. Their normalizing influences on the regulation of various metabolic processes improve hypothalamic-pituitary-adrenal (HPA) functioning, and counter catabolic processes associated with enhanced oxidative stress. Adaptogens form a unique group of nontoxic nutraceuticals that support the health of the adrenal system, and help to normalize the physiologic disturbances resulting from chronic stress by correcting imbalances in the neuroendocrine system and alterations in immune functions. Safe for long term use, adaptogens calm the body and simultaneously boost energy without overstimulating. By supporting adrenal function, they counteract the adverse effects of stress, and enable efficient oxygen utilization without disturbing normal biological functions. Ashwagandha – Prized for its restorative properties, ashwagandha is an ancient and powerful therapeutic herb that has been utilized for centuries to tone, support and rejuvenate bodily functions. It is perhaps most commonly known for its ability to support the body’s resistance to the negative effects of physiological and psychological stress. Ashwagandha helps the body to cope with external stressors such as toxins in the environment, as well as internal stresses such as anxiety and insomnia. Ashwagandha can help alleviate symptoms of stress, fatigue, low energy and difficulty concentrating. Rhodiola rosea – Rhodiola is a potent adaptogen that contains phytochemicals that help to relieve anxiety and combat stress-related mental and physical fatigue. Described as a versatile adaptogen, rhodiola helps to increase the body’s stress resistance by balancing stress hormone levels, raising or lowering cortisol as needed. Rhodiola has demonstrated the ability to support cellular energy metabolism, and positively affect brain function and heart health. Studies on rhodiola suggest that this adaptogen holds promise for increased mental and physical performance. Holy basil – Many studies support the use of holy basil as a therapeutic tonic for the mind, body and spirit. In addition to its adaptogenic properties, holy basil has antioxidant, antibacterial, antiviral, antifungal, anti-inflammatory and analgesic compounds. Research has shown that holy basil can help to reduce symptoms of stress, forgetfulness, exhaustion and sleep issues. Ayurvedic practitioners recommend holy basil to foster relaxation, mental clarity and a sense of overall wellbeing. It is recommended that those who are pregnant, lactating, or taking medications consult their healthcare practitioner before staring on any supplement regimens. Ayur-Ashwagandha 300 mg by Douglas Laboratories®: One serving provides 300 mg of standardized ashwagandha root extract in support of a healthy stress response, energy production, improved mental and physical performance, and overall wellness. Gluten, soy, dairy, yeast, wheat and artificial ingredient free formulation. Rhodiola Rosea by Pure Encapsulations®: Each capsule provides 100 mg of standardized rhodiola rosea extract in support of occasional mental and physical stress, cellular health, and cardiovascular and metabolic function. Gluten and soy free, Non-GMO vegetarian formulation. Holy Basil by Himalaya® Herbal Healthcare: This certified organic, broad-spectrum herbal adaptogen provides support for stress, emotional wellbeing, and relaxation. Holy Basil supports proper adrenal function and a healthy stress response, and promotes restful, rejuvenative sleep. Gluten and additive free, Non-GMO, vegetarian formulation. HPA Adapt™ by Integrative Therapeutics®: This stress resistance complex provides five powerful adaptogenic herbs in support of healthy stress hormone balance via the HPA axis. This non-stimulant nutraceutical reduces mental stress and fatigue, improves mood, calms occasional anxiety and supports cognitive function. Gluten, wheat, soy, yeast, sugar, preservative, and artificial ingredient free, vegetarian formulation. Adaptogen Support Complex by Professional Complementary Health Formulas: This adaptogenic herbal complex provides phyto-synergistic and nutritional support for a balanced stress response and overall wellness. Gluten and soy free, vegetarian formulation. This entry was posted in Home and tagged About Adaptogens, Adaptogen Support Complex by Professional Complementary Health Formulas, Ashwagandha, Ayur-Ashwagandha 300 mg by Douglas Laboratories, Ayurvedic medicine, Holy basil, Holy Basil by Himalaya® Herbal Healthcare, HPA Adapt by Integrative Therapeutics, Rhodiola rosea, Rhodiola Rosea by Pure Encapsulations. Bookmark the permalink.